Astronomers have found a new eclipsing binary system by analyzing archival survey data and conducting follow-up radial velocity measurements. The newly found binary, designated SDSSJ1156-0207, is composed of two M-dwarf stars orbiting each other at a relatively close distance. The finding is presented in a paper published December 24 on the arXiv pre-print repository. M-dwarfs, especially in eclipsing binaries, could be crucial for improving our understanding about fundamental stellar parameters of low-mass stars. In eclipsing binaries, the orbit plane of the two stars lies so nearly in the line of sight of the observer that the components undergo mutual eclipses. Such systems can provide direct measurement of the mass, radius and effective temperature of stars. 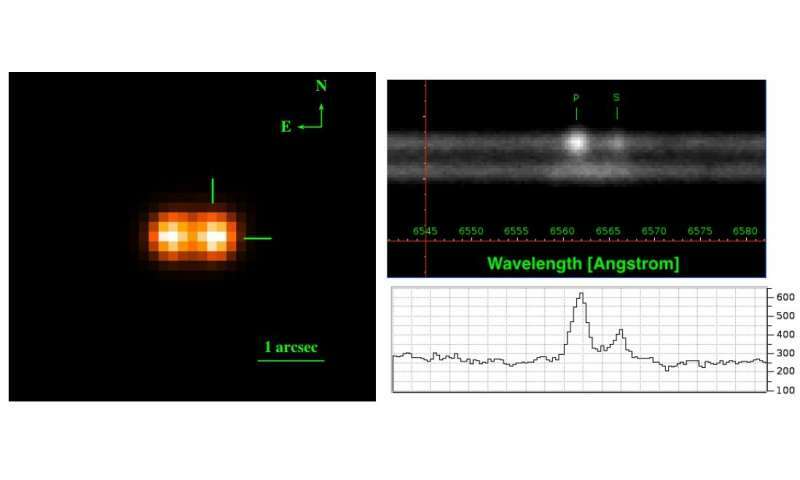 Now, a group of researchers led by Chien-Hsiu Lee of the National Astronomical Observatory of Japan, has identified a new M-dwarf eclipsing binary system. The binary, which received designation SDSSJ1156-0207, was found in the data available in the Sloan Digital Sky Survey (SDSS) and in the Catalina Sky Survey (CSS). The newly detected object was later characterized by follow-up radial velocity measurements using Gemini Multi-Object Spectrograph onboard the Gemini North telescope in Hawaii. Credit: Lee at al., 2017. Left: GMOS acquisition image of the binary system. The binary system is indicated by the green mark, where the third object (at a separation of 0.5 arcseconds) is well resolved. The Gemini spectra were carried out with a position angle of 90 degrees east of north, hence were resolve both the eclisping binary system and the third object into spectra. Right: GMOS spectra. The top panel shows the eclipsing binary spectrum (upper) and the third light object spectrum (lower). The primay (P) and secondary (S) component of the eclipsing binary system are indicated by the green label. The bottom panel shows the relative flux (in ADU) of the Hα emission line from the primary and secondary component of the ecliping binary system. A group of astronomers of the University of Alicante, Spain, has discovered that the binary star system HD 64315 is more complex than previously thought. HD 64315 (also known as HIP 38430) is the main ionising source of the Galactic H ii region Sh2-311. It was initially classified by previous studies as a binary star, located some 16,000 light years away from the Earth. However, a new study reveals breakthrough information about this stellar system. The new study reveals that HD 64315 contains at least two binary systems composed of massive stars, one of which is an eclipsing binary.